Steep Ravine’s soulful sound takes roots music in compelling new directions. 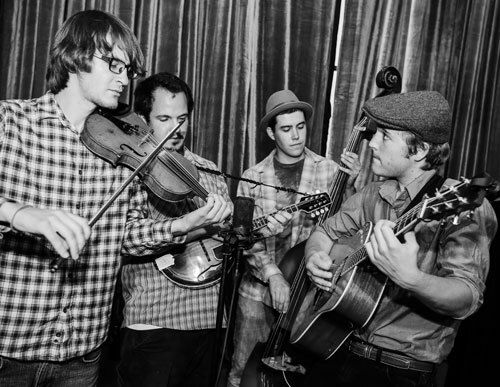 Fusing elements of “folk-rock”, “bluegrass”, and “jazz”, the band continues to enthrall audiences with their uniquely Californian sound. Songwriter Simon Linsteadt (guitar, lead vocals) and Jan Purat (violin, vocals) began playing music together in high school in Northern California, later moving on to study music at UC Santa Cruz and the California Jazz Conservatory. They fortuitously met bassist Alex Bice (bass, vocals) through jam sessions in Santa Cruz. Percussionist Jeff Wilson, a close musical compadre, is the band’s most recent addition. Steep Ravine has toured extensively throughout the country and has released two full-length records of all original material. Following their humble beginnings playing at a Hawaiian barbecue spot in Santa Cruz and busking in the BART Metro Stations of San Francisco, Steep Ravine quickly gained a following in the Bay Area and throughout the west. After the release of their debut record TRAMPIN’ ON, the band went on several national tours, including notable performances at High Sierra Music Festival, Four Corners Folk Festival, Outside Lands, and Strawberry Music Festival. In 2015, Steep Ravine released their second record THE PEDESTRIAN, diving deeper into new musical terrain.